Today Line Antoft, Martin Ploug, David Brauner, Carlos Buhler and I wanted to climb a long route together. It is not an easy undertaking to ice climb long routes with five people as falling ice etc. makes it potential dangerous and slow going. However, the route This House of Sky is ideal for this purpose as it mainly consist of short and easy ice steps and snow fields which can be soloed which increase the speed dramatically. 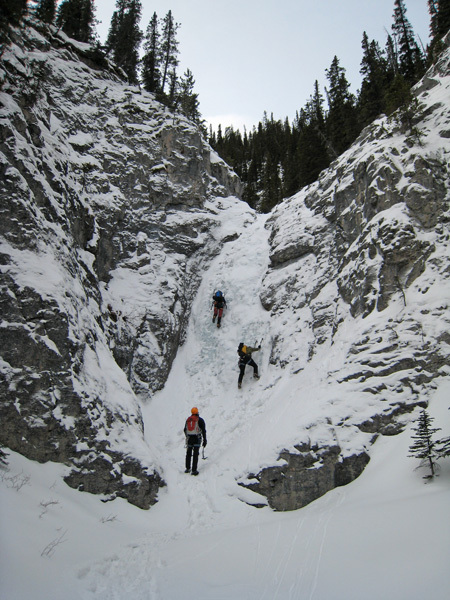 Furthermore, the two steep passages which need rope and protection are wide enough to allow two simultanous climbers. 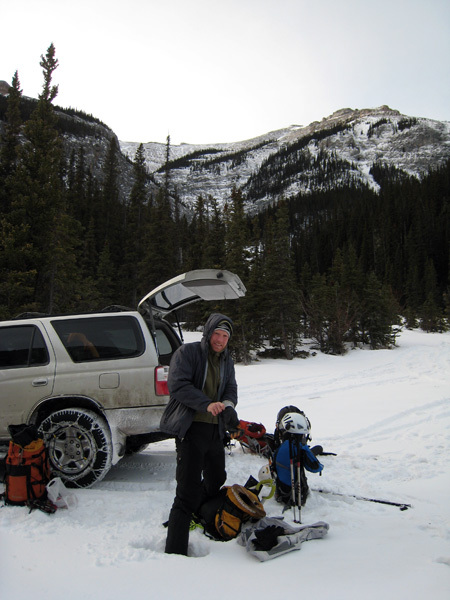 The route is located in North Ghost and is thus quite remote - unless you have a driver like Carlos which is not affraid of putting his 4WD truck to the test! He thus managed to drive us all the way to the base of the climb with 10 min walk in! After that interesting 4WD drive it was a very enjoyable climb, where we just took it easy and soloed the WI2-3 ice steps carefully until we reached the WI3-4 ice pillar which many consider the end of the climb. David and Martin won the slots to lead the pillar after which we actually continued up to a WI3 section which was so long that we decided to use the ropes again. Carlos saw an interesting thin variation to the left which we climbed whereas David lead the thick and wide ice on the right followed by Line and Martin. 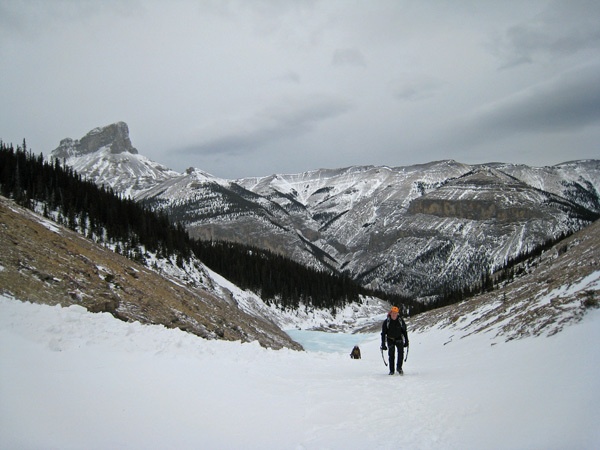 Initially the climb follows a narrow canyon which gradully widens which dramatically increased our exposure to the wind. As we got to the top of the WI3 section it certainly felt like a true alpine experience with spin drift and hard wind gusts that threw us a bit out of balance. After 750 vertical climbing from the car we thus decided to call it a day and began rappelling. After approximately 7-8 rappels and some down climbing we reached the car. A great route if you like to just get some mileage on your ice axes in a very beautiful setting! Carlos managed to get his 4WD truck all the way to the base of climb which is in the valley behind the car! 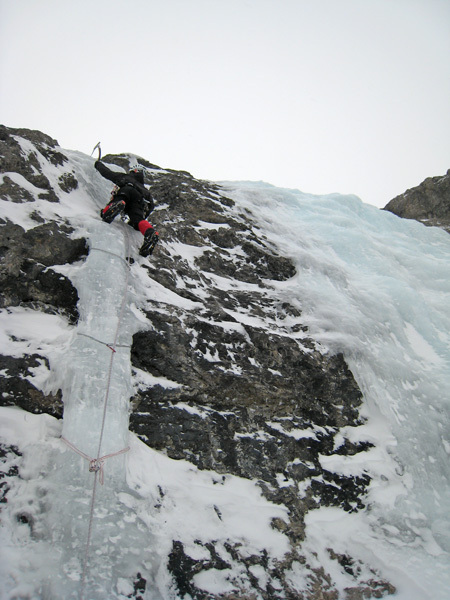 A typical situation on the route - soloing short WI2-3 steps which were pretty hacked out and thus very easy. 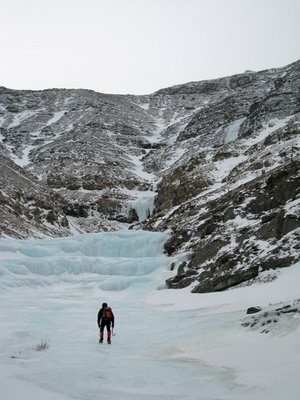 Another typical situation on the route - walking up snow fields and easy ice. Note the beautiful sorroundings. 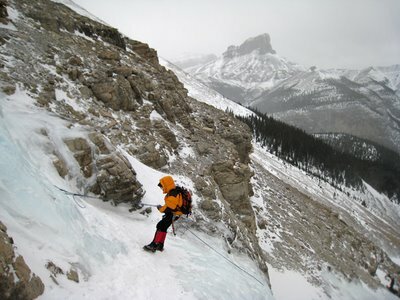 Carlos walking up to the crux WI3-4 pillar (middle of picture) and the final long WI3 pitch (upper right hand corner). 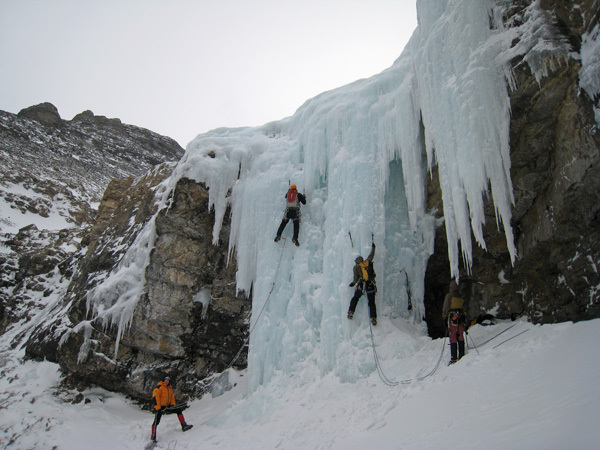 David (left) and Martin (right) leading the crux pillar. 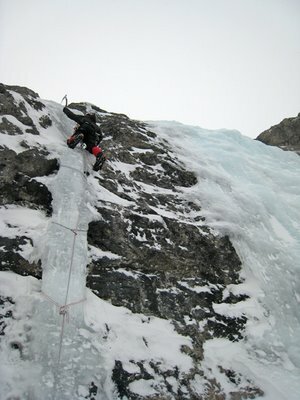 Carlos leading the interesting thin variation of the last WI3 pitch (seen to the right). Carlos rappelling from an abalakov anchor from our high point above the WI3 pitch. 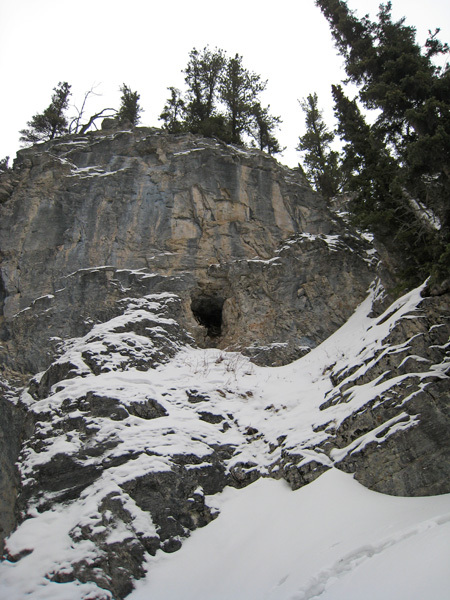 On the way out we noted this rock cave with wood braches at the bottom. We were quite sure it was a bear cave but none of us had the gust to go up and look into it. Also we didn't want to disturb the bear so we just hurried out of there. Normally you are safe when you get back to the car - but not in The Ghost where you are not safe until you are back on the highway! Here we hacked ice away in order to cross The Ghost River. Driving in The Ghost is always an interesting experience in itself!